« BBC: Why do US evangelicals support Trump’s Jerusalem policy? BERLIN (Reuters) – German Chancellor Angela Merkel, weakened by an election setback in September, launches a second bid to build a coalition government on Sunday when she sits down with the Social Democrats (SPD) for exploratory talks. Germany still does not have a ruling coalition. If more efforts fail, then another election may have to happen. Many Germans are not pleased with the result of Angela Merkel’s immigration policies, and this has affected her ability to put together a ruling coalition–as has her own governing style with previous coalition leaders. Well, for the time being, something will work out–either via a soon coalition or something after another election. But the time will come when Germany and other nations in Europe will turn from claimed democracy to dictatorship. The above leader sounds a lot like a European leader that the Bible says will arise. And, of course, by and large, Europe is considered mostly secular and irreligious. Apathy is rampant towards the Church of Rome in Europe. The attempt to unify Europe as one economic, military and political power bloc restoring the “Holy Roman Empire,” has been the one aim of all the “great” men who dominated European history from Napoleon’s “Waterloo” until now. Mussolini, dominating Eritrea, Italian Somaliland, Libya, and conquering Ethiopia, did officially name his weak “Empire” the “Roman Empire.” But now the dream of a mighty, powerful, resurrected Roman Empire at last is becoming a hard-driving reality. This is an important “end-time” prophecy. Following the chronological progression of the chapter, it becomes apparent that the phrase “king of the north” had at first referred to Syria under the Seleucid dynasty, and later, in the New Testament times, to the Emperor of the Roman Empire. … Thus, in its final end-time application, the “king of the north” is the prophesied strong man who will lead a coming union of ten European nations — the seventh and final revival of the ancient Roman Empire prophesied by Daniel and in the book of Revelation (see Revelation 17:12-13). But who is the “king of the south”? In the earlier portions of Daniel 11, the phrase refers without question to ancient Egypt under the rule of the Ptolemaic dynasty, later including Ethiopia which was annexed to Egypt. But in verse 40 we skip to “the time of the end” … Its greater fulfillment is yet future! Just as there is yet to be a final “king of the north” — called in Bible symbolism “the beast” — who will arise as superdictator over an end-time European confederation, there may very well emerge in the same manner a final “king of the south” — an overall leader of an Arab-Moslem confederation, possibly even bearing the very title Mahdi! And these two individuals will eventually find themselves in a head-to-head confrontation — possibly over oil — which will ultimately lead to devastating war in the Middle East! Expect conflict, as well as change, in Europe. There will be conflict between the Europeans and the Arabs (watch also the video sermonette: War is Coming Between Europeans and Arabs). What about the view of some Worldwide Church of God writers that this dictatorial leader will be German? Well, people are starting to notice that Europe is already being dominated by Germany (see ‘Undemocratic’ European Union has become a German empire). Finally feeling the chilling embrace of Moscow, the German people may yet call for the Bavarian strongman — the one they feared in good times — to rescue them from their impending doom. (Hogberg G. WHERE Is WEST GERMANY Headed? Plain Truth, December 1980). A Bavarian strongman would be someone from Bavaria in Germany. The one that Gene Hogberg had in mind back in 1980 (Franz Joseph Strauss) died. Yet, let me add that there is another Bavarian strongman who I have kept my eye on who may one day rise up. His name is Karl-Theodor zu-Guttenberg (see Might German Baron Karl-Theodor zu Guttenberg become the King of the North?). A reader sent me a link a while back to a presentation that Herr Guttenberg gave in May of 2016 where he called for more passionate leaders in Europe. One such leader will arise. 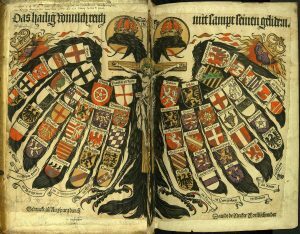 When the time comes for the final Beast leader to arise, he will most likely be at least partially German, as all the leaders of the old Holy Roman Empire were as well. Germans and other Europeans will get sufficiently frustrated with democracy (as well as will be deceived by various signs and lying wonders–2 Thessalonians 2:8-12) that they will support a dictatorial leader over Europe. This entry was posted on Friday, January 5th, 2018 at 5:00 pm	and is filed under Prophecy.